The tumor suppressor protein p16INK4a has been extensively studied in many tumors with very different results, ranging from its loss to its clear overexpression, which may be associated with degree of tumor differentiation and prognosis. However, its expression remains unclear in human retinoblastoma (RB), a common malignant tumor of retina in childhood. The aim of this study was to explore the expression pattern of p16INK4a in RB, and the correlation between p16INK4a expression and histopathological features of RB. Sixty-five cases of RB were retrospectively analyzed. Paraffin-embedded blocks were retrieved from the archives of ocular pathology department at Zhongshan Ophthalmic Center of Sun Yat-sen University, China. Serial sections were cut and subjected to hematoxylin and eosin staining. Immunohistochemical staining was further done with antibodies p16INK4a, CRX and Ki67. The correlation of p16 INK4a expression with CRX and Ki67 and clinicopathological features of RB were analyzed. RB tumor histologically consists of various differentiation components including undifferentiated (UD) cells, Homer-Wright rosettes (HWR) or Flexner-Winterstein rosettes (FWR) and fleurettes characteristic of photoreceptor differentiation or Retinocytoma (RC). p16INK4a expression was negative in both fleurette region and the residual retinal tissue adjacent to the tumor, weakly to moderately positive in FWR, strongly positive in both HWR and UD region. However, CRX had the reverse expression patterns in comparison with p16INK4a. It was strongly positive in photoreceptor cells within the residual retina and fleurettes, but weakly to moderately positive in UD area. Together with Ki67 staining, high p16INK4a expression was associated with poor histological differentiation of RB tumors, which had higher risk features with the optic nerve invasion and uveal invasion. p16INK4a expression increased with the decreasing level of cell differentiation of RBs. RB tumors extensively expressing p16INK4a tended to have higher risk features with poor prognosis. This study suggested that p16INK4a would be a valuable molecular marker of RB to distinguish its histological phenotypes and to serve as a predictor of its prognosis. Traditionally, level of neoplastic differentiation is a crucial index of adjuvant chemotherapy and prognosis. Retinoblastoma (RB), the most common primary malignant intraocular tumor in childhood, has different pathological phenotypes from undifferentiated tumor cells, Homer-Wright rosettes (HWR) or Flexner-Winterstein rosettes(FWR) to fleurettes. These phenotypes reflect to some extent the level of tumor differentiation which is a key factor in grade of retinoblastoma and prediction of its prognosis ,. For example, retinocytoma (RC), also called retinoma, has been proposed to be the benign variant of RB since it is largely composed of benign-appearing cells with elongated eosinophilic fleurettes similar to the inner segment of photoreceptor cells and because it has better prognosis than RB in general -. However, these components with various degree of differentiation have been a challenge to be morphologically identified by researchers, sometimes even by experienced pathologists. It would therefore be very useful to find out a panel of molecular markers to distinguish them and to predict progression of RB. p16INK4a, a tumor suppressor protein, has played an important role in cell cycle control, cell senescence and tumor development. It has been extensively studied in both benign and malignant lesions with very different results, ranging from its loss to its clear overexpression . For instance, in benign lesions such as nevi and neurofibroma, p16INK4a overexpression was associated with senescence ,; whereas in malignancy such as HPV-positive cervical cancer, breast cancer and colorectal adenocarcinoma, it appeared to be associated with high-grade tumors along with RB gene alterations -. In recent years, p16INK4a has been used as a diagnostic marker to distinguish between benign and malignant lesions, and some evidence suggests that it also plays a prognostic role in tumors that overexpress p16INK4a. p16INK4a expression in RB remains controversial, especially in regarding of its expression patterns in histological phenotypes of RB ,,. Dimaras and colleagues reported that p16INK4awas expressed in fleurette regions but negative in undifferentiated regions . Conversely, SE Coupland et al. described a reverse expression pattern of p16INK4a that was positive in undifferentiated areas of 23 RB tumors . To better understand p16INK4aexpression and its potential role in RB, we evaluated the expression patterns of p16INK4a, Ki67 and CRX through a large cohort of 65 RB tumors. CRX is required for the terminal differentiation and maintenance of photoreceptors  and has been shown to be a differentiation marker of RB ,. Our results demonstrated that p16INK4a expression increased with the dedifferentiation of RB, showing strongly positive in undifferentiated cells and HWR, weakly to moderately positive in FWR, but negative in well-differentiated cells with fleurettes. This expression trend of p16INK4a was consistent with that of Ki67, but reverse to that of CRX in RB tumors. The results indicated that p16INK4a would be a valuable molecular marker of RB in distinguishing histological phenotypes and in serving as a predictor of its prognosis. Formalin-fixed, paraffin-embedded retinoblastoma blocks were retrieved from the archives of ocular pathology department at Zhongshan Ophthalmic Center of Sun Yat-sen University, China during a 3-year period (2008 to 2010). The cases with chemotherapy or radiotherapy prior to enucleation were excluded. Serial sections of 4 μm thick were cut, and subjected to hematoxylin and eosin (HE) staining. 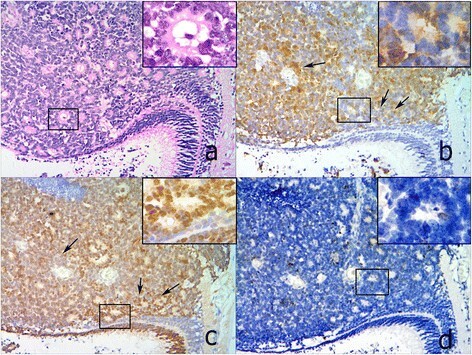 The tumor samples were divided into four groups according to the level of cell differentiation: undifferentiated (UD) group predominantly consisting of undifferentiated tumor cells and pseudorosettes; HWR or FWR group in which rosettes accounted for over 70% of the lesion according to the predominant rosette phenotype; and RC group in which fleurettes characteristic of photoreceptor differentiation accounted for over 60% of the lesion ,. The study was approved by Medical Ethical Committee of Zhongshan Ophthalmic Center, Sun Yat-Sen University. Sections were deparaffinized in xylene, re-hydrated and incubated in 0.3% hydrogen peroxide (H2O2, Sigma, St. Louis, USA) for 30 min to block endogenous peroxidase activity. 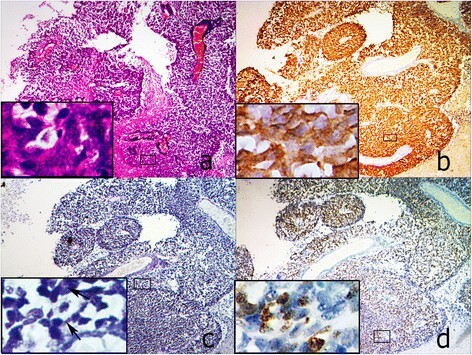 Antigen retrieval was achieved using 0.01 M citrate buffer, pH 6, in a pressure cooker for 45 s. For immunohistochemistry, the sections were stained with rabbit anti-CRX (1:200) (C7498, Sigma, St. Louis, USA), mouse anti-human p16INK4a (ZJ11, Maixin-bio, China) and rabbit anti-Ki67 (1:200) (sc-15402, Santa Cruz, California, USA) respectively. Signals were detected using the Dako-Cytomation EnVision+ anti-rabbit or anti-mouse secondary system. The slides were then incubated in DAB solution (Vector Laboratories DAB substrate kit for peroxidase) for approximately 1 min, then washed in PBS and counterstained briefly in Harris hematoxylin. Images were taken using a BX51 microscope (Olympus, Japan). The primary antibody was replaced by dilution buffer as a negative control. The residual retinal tissue adjacent to tumor was considered as an internal control. The sections were semi-quantitatively evaluated for the expression level of proteins according to reference with modifications . Briefly, the intensity of CRX and p16INK4a expression was scored on a scale of 0–2: 0, negative, 1, weak, and 2, strong; whereas the extent of both p16INK4a and Ki67 expressions was scored as followings: grade 0, no staining; grade 1, < 40%; grade 2, 40-80%; and grade 3, 80–100% of tumor cells in the respective lesion. To analyze the association of p16INK4a with clinicopathological features, both grade 0 and 1 were considered as low expression, both grade 2 and 3 as high expression. The high-risk feature evaluation included the presence and extent of optic nerve invasion and the massive choroidal invasion . All specimens were screened and evaluated by two experienced pathologists blinded to the clinical information. Spearman’s rank test and the Kruskal-Wallis test were used to analyze the progressive increase of p16INK4a expression in various pathological types of RB. The association between the expression measured via immunohistochemistry and high-risk features was analyzed using chi-squared tests and Kruskal-Wallis tests. In all analyses, p < 0.05 was accepted as statistically significant. These analyses were performed using the SPSS 16.0 software package (SPSS Inc., Chicago, Illinois, USA). Clinicopathological features were summarized in Table 1. Sixty-five enucleated eyeballs with RB were enrolled in this study. In our population, males (63.1%, 41/65) outnumbered females (36.9%, 24/65), with ages ranging from 1.73 months to 9 years and a mean value of 21.7 ± 20.0 months. The UD group accounted for 58.5% (38/65) of all tumors, and HWR 26.2% (17/65), FWR 10.8% (7/65) and RC 4.6% (3/65). Patients in the UD and RC groups were older than patients in the HWR and FWR groups, on average. aGrouping was according to international intraocular retinoblastoma classification (IIRC) . Histologically, retinoblastoma consists of undifferentiated small round cells with scant cytoplasm and large nucleus. This tumor often contains certain amount of differentiated cells with more cytoplasm depending on the level of differentiation. The undifferentiated tumor cells usually scatter or form pseudorosettes around the blood vessel. In contrast, the differentiated cells can form specific structures from HWR or FWR to fleurettes with the increasing level of cell differentiation. In 65 cases, there were 3 tumors in RC that predominantly comprised of fleurette surrounded by some middle-size tumor cells. p16INK4a in these fleurette structures was totally negative, which was similar to that in the residual adjacent retinal tissue, but positive in the surrounded tumor cells (Figure 1a, b). In FWR group, 4 out of 7 FWR weakly expressed p16INK4a, except for 3 cases (3/7) with moderate to strong immunoreactivities primarily located in the cytoplasm (Figure 2a,b). However, p16INK4a expression in HWR area was similar to that observed in undifferentiated cells, most of which were strongly positive but primarily located in the cytoplasm (Figure 3a, b). Compared with the above groups, most of tumors (31/38) in the UD group were strongly positive for p16INK4a, which was located in both the cytoplasm and nucleus (Figure 4a, b), except for 5 cases (5/38) that were primarily cytoplasmic positive and 2 cases (2/38) that were weakly positive. As the degree of differentiation increased from the UD group to RC group, the expression level of p16INK4a decreased (ρ = −0.770; p = 0.000; Spearman’s rank test). Expressions of p16 INK4a , CRX and Ki67 in a representative RB case from RC group (100x). a. 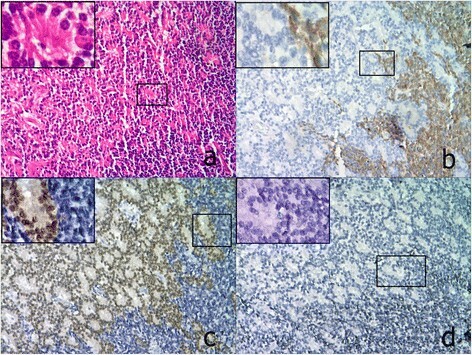 HE staining showed well-differentiated RC cells with typical fleurettes surrounded by moderately differentiated tumor cells; b. p16INK4a was negative in the RC region, but positive in the surrounding tumor cells. A magnified image (insert) shows the transition zone between the RC and the tumor cells; c. CRX expression displayed the opposite pattern to that of p16INK4a, being strongly positive in RC region but negative in the surrounding area; d. Ki67 expression was similar to that of p16INK4a, with barely positive cells in RC region. All inserts, 200x. Expressions of p16 INK4a , CRX and Ki67 in a representative RB case from FWR group (100×). a. HE staining showed FWR. b. p16INK4a was moderately positive in FWR, but negative in the residual retina adjacent to the tumor. c. CRX expression was strongly positive in FWR, similar to the photoreceptors in the residual retina. d. Ki67 expression was similar to p16INK4a, with a few of positive cells scattered in FWR. When comparing b and c, a complementary expression pattern between p16INK4a and CRX is seen (black arrow). All inserts, 200x. Expressions of p16INK4a, CRX and Ki67 in different histological phenotypes of one RB case from HWR group (100×). a. HE staining showed 3 histological phenotypes of RB, including RC (in black frame), HWR (in red frame) and UD (in green frame). The yellow frame highlighted fleurette structures in RC region with higher magnification (200x). b. The level of p16INK4a progressively increased from the region RC to HWR, then to UD. c. CRX was strongly positive in both RC and HWR region, but weakly to moderately positive in UD. d. The number of Ki67 positive cells scattered was increased from region RC, HWR to UD. Expressions of p16INK4a, CRX and Ki67 in a representative RB case from UD group (40×). a. HE staining showed the tumor predominantly consisted of UD cells with scanty cytoplasm and large nucleus forming pseudorosettes. b. p16INK4a was strongly positive in both cytoplasm and nucleus of most of tumor cells. c. CRX expression was weakly to moderately positive in these tumor cells. d. Most of UD cells were positive for Ki67, similar to p16INK4a. All inserts, 200x. To further determine the correlation of p16INK4a expression with the level of cell differentiation, we detected the expression of both the photoreceptor differentiation marker CRX and the cell proliferation marker Ki67 in consecutive sections of retinoblastoma samples. In RC group, the fleurette strongly expressed CRX, but negatively Ki67 (Figure 1c, d), with the similar patterns to photoreceptor cells in the residual adjacent retina. In FWR region, cells were moderately to strongly positive for CRX with a few of Ki67 positive cells scattered (Figure 2c, d). In HWR region, cells were moderately positive for CRX with more Ki67 positive cells scattered (Figure 3c, d). Nevertheless, cells in UD region weakly to moderately expressed CRX with many Ki67 positive cells (Figure 4c, d). Therefore, considering together with the expression of p16INK4a described above, our results demonstrated that p16INK4a and Ki67 expression decreased, but CRX increased with the increasing level of cell differentiation. Using Spearman’s rank test, we found not only a positive correlation between p16INK4a and Ki67 but also an inverse correlation between p16INK4a and CRX, suggesting a possible relationship between p16INK4a expression and the degree of RB differentiation. The correlation was summarized in Table 2. Of 65 RB cases, 55 tumors (85%) had high expression of p16INK4a, and 10 tumors (15%) low expression. Most of tumors with high level of p16INK4a expression originated from UD (36/55) and HWR (16/55) groups, whereas most tumors with low level of p16INK4a from RC (3/10) and FWR (4/10). Statistic analysis showed the extent of p16INK4a expression among these four groups existed significant differences (P = 0.000, Kruskal-Wallis test). In addition, tumors with high expression of p16INK4a tended to have higher risk features with either optic nerve invasion (22%) or massive choroidal invasion (23%) even though statistically significant correlation was not found between the extent of p16INK4a positivity and the presence of high-risk features. One of the two weakly positive p16INK4a cases in the UD group had high-risk features that tumor cells were found in the line of surgical transaction. But no case with massive choroidal invasion had HWR, FWR or RC groups. aMann–Whitney rank sum test; bFisher’s exact test.cKruskal-Wallis test. dThe criterion of massive choroidal invasion was the maximum diameter (thickness or width) equal to 3 mm or more in any diameter.eThe number in brackets was the immunochemistry score of p16INK4a. The development of RB involves sequential genetic lesions, and the loss of RB protein (pRB) is the first step and the basis of other biological alterations. In 1998, Schwartz found that pRB dysregulation resulted in increased p16INK4a expression in colon cancer, due to positive feedback . In recent years, the progressive increase of p16INK4a expression accompanying pRB dysfunction had been described in many tumors . In 2011, Witkiewicz summarized two complementary models for the appearance of tumors with high levels of p16INK4a. In the first model, p16INK4a was elevated in some precancerous lesions due to oncogenic stress. If the RB1 gene was functional, the cells became senescent; otherwise, they became cancerous. In the second model, p16INK4a increased via a feedback loop in response to pRB dysfunction and was associated with highly malignant tumors. The results of the present study were consistent with the second mechanism described by Witkiewicz. 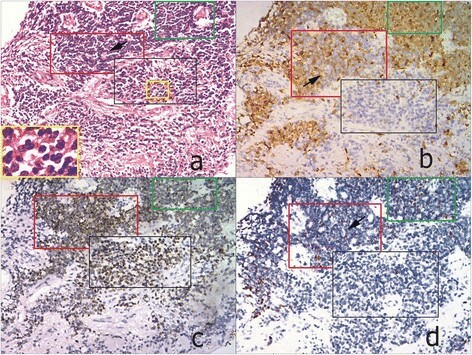 Immunohistochemistry investigation of p16INK4a in RB tumor samples had been reported with controversial results. Dimaras et al. described p16INK4a expression in 8 RC cases, showing p16INK4a positive in the benign RC region but negative in the RB area . However, SE Coupland and colleagues reported the reverse expression pattern that p16INK4a was negative in RC area but positive in poorly and moderately differentiated areas in their 23 RB tumors . Similarly, Indovina et al. described that 6 out of 11 RB cases were 100% positive for p16INK4a and that other cases were 5%-40% positive , implying that undifferentiated tumor cells were positive. In our 65 cases, the expression pattern of p16INK4a in RB was closer to what SE Coupland described in a way that the level of p16INK4a was increased from negative expression in well-differentiated fleurette structures to highly strong expression in poorly differentiated area. This pattern of p16INK4a in RB was similar to that of Ki67, but reverse to that of CRX. Therefore, our study indicated that p16INK4a could serve as a potential molecular marker to distinguish the level of cell differentiation in RB tumors. The classic function attributed to p16INK4a has been cell cycle regulation in the nucleus; however, p16INK4a overexpression could occur in both the cytoplasm and nucleus of malignant cells. For example, in colorectal and breast cancers, p16INK4a exhibited strong nuclear/cytoplasmic positivity in primary or metastatic carcinomas, whereas negativity or low nuclear expression was observed in normal mucosa and benign fibroadenoma ,. Previous studies had shown that p16INK4a appeared in the cytoplasm and/or nucleus in RB tumor cells ,,. Similarly, in our RB cases, the location of p16INK4a expression largely depended on the degree of tumor differentiation, from staining in both the cytoplasm and nucleus of poorly differentiated cells to primary cytoplasm of moderately differentiated cells. Moreover, negative expression of p16INK4a was seen in both the residual retina adjacent to the tumor and normal human retinal tissue. Nevertheless, the significance of different sublocations of p16INK4a expression in malignant cells has not been clearly clarified yet,which may be associated with the prognosis of the malignant tumor. Many efforts have been made to understand the regulation mechanisms underlying p16INK4a expression location within the tumor cells and its possible therapeutic value by re-locating the dislocated p16INK4a to the optimal subcellular site in the malignancy -. More work is needed to answer these questions in the RB cases. To date, the prognostic factors of RB remained a subject of intense discussion among ophthalmologists. The only consensus was that some high-risk histopathological features, such as the presence and extent of optic nerve invasion and the location and extent of uveal invasion , may be predictive. Grade of tumor differentiation has also been served as a key predictor of RB prognosis for a long time. In our 65 RB cases, both RC and FWR groups could be classified into the low grade of RB tumors, where most of tumors expressed low level of p16INK4a. However, the other two groups HWR and UD could be taken as the high grade of RBs, where most of tumors expressed high level of p16INK4a. Our results also demonstrated tumors with high expression of p16INK4a had higher risk features with the optic nerve invasion and uveal invasion. These data suggested that the overexpression of p16INK4a might be a risk predictor of the poor prognosis of RB tumors. In conclusion, our study demonstrates that p16INK4a expression correlates with RB differentiation. The lack of p16INK4a expression is a reliable marker of RC, a benign RB lesion. However, high-grade RB tumor is accompanied by an increase expression of p16INK4a, as determined by rigorous scoring approaches and multi-marker combinations. Our conclusions are based on a series of cases devoid of any follow-up information; thus, further investigation will be required to evaluate its value as a molecular marker of RB prognoses and therapeutic responses. Yue Liu, Xiufeng Zhong contributed equally to this work. This project was supported by grants from the Natural Science Foundation of China (30672276) and Guangdong Science and Technology Planning Project, China (2008B030301081). The authors thank Yungang Ding for assistance in preparing the histological specimens. YL and YPL designed the experiment. YL and XZ analyzed the data and wrote the manuscript. YL, STW, WXZ and JXL carried out the immunohistochemical examination. PZ and YPL evaluated clinicopathological data. YPL provided the funding support. All authors read and approved the final manuscript.